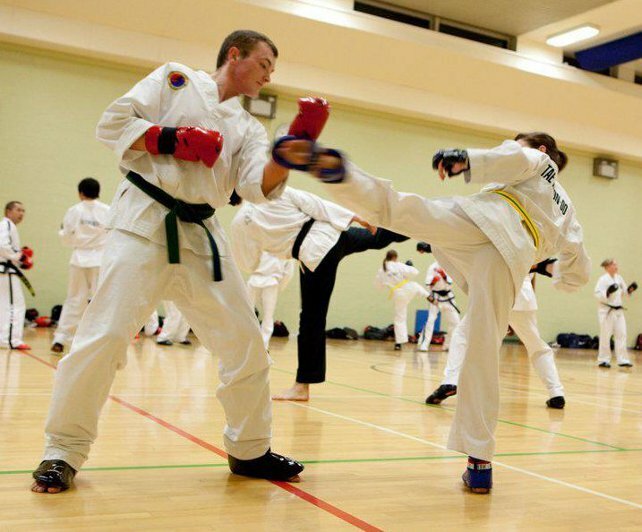 Although Taekwon-Do is a defensive art, training by the practical application of techniques against a real adversary, or even several, is very important. It is also an excellent way to check how well a student has learned. Sparring is indispensable for the student who wishes to progress. During sparring, he or she will test skills acquired, learn to recognise and, with practice, anticipate the opponent's tactics; sparring builds self-control, self-confidence, and courage. Students will be allowed to take part in sparring at the instructor's discretion. Usually, students will only be allowed to spar if equipped with a full set of protective pads. However, the instructor may allow under-padded students to take part in more restricted (e.g. no contact) sparring according to their experience and ability. Students who fight over-enthusiastically (i.e. above the level of contact expected for their grade and opponent's abilities) may be cautioned by the instructor. Repeated cautions, or behaviour resulting in injuries to others will result in sanctions. During training, contact should be kept to a minimum. As a rule of thumb, the lower level of contact desired by either of the partners sparring should be used. Clearly, contact levels tend to be higher at senior grades and for more experienced sparrers. A higher grade sparring a lower grade is considered responsible for keeping contact at an appropriate level. A higher grade sparring a lower grade will be held responsible if the junior grade gets injured. If contact levels are too high, the instructor will warn the students involved, or the entire class. If contact levels are not kept down, the instructor will stop the students involved, or the entire class. Students without appropriate protective gear will not be allowed to spar with contact. Non contact sparring may be allowed at the instructors' discretion.